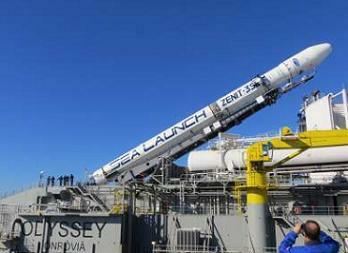 The Sea Launch company launched their Zenit-3SL rocket from the Odyssey Launch Platform in the Pacific Ocean on Friday. However, the vehicle – along with its Intelsat 27 telecommunications satellite payload – suffered a failure during first stage flight, resulting in a complete loss of mission. The launch was on time 06:56 GMT launch on Friday, as the vehicle began its mission to loft the satellite into optimized geosynchronous transfer orbit, en route to its new home at 304.5 degrees East longitude. However, with a very poor webcast stream, only parts of the countdown and launch were watchable, with no audio. The webcast was then stopped, initially believed to be because of the poor quality of the stream. Sadly, it was due to the failure of the vehicle, 40 seconds into first stage flight, according to Russian media giants RIA Novosti, later confirmed by Sea Launch themselves. “We are very disappointed with the outcome of the launch and offer our sincere regrets to our customer, Intelsat, and their spacecraft provider, BSSI,” said Kjell Karlsen, president of Sea Launch AG. Sea Launch will establish a Failure Review Oversight Board to determine the root cause of the incident and will provide additional information, as it becomes available. The first stage of the vehicle was then scheduled to separate 2:30 minutes (150 seconds) after liftoff, and the protective payload fairing will be jettisoned 82 seconds later at 3:52 minutes. The second stage would have then conducted a 6 minute burn, followed by its separation from the Block DM-SL upper stage. The Block DM-SL would have begun its first and only burn at 8:41 minutes (521 seconds) into the mission, for the duration of 699 seconds. The upper stage would have then shut down for an almost 10 minute coast period before spacecraft separation over equatorial South America. The now lost Intelsat 27 satellite was based on the Boeing 702MP mid-level power platform and is designed to provide 15 or more years of satellite service. The spacecraft had 20 C-band transponders for coverage over the Americas and Europe, and 20 Ku-band transponders with mobility beams spanning the north Atlantic, Mexico and Brazil. The bird had a mass of 6,215 kilograms, and its payload would have been powered by two solar wings, with three panels of ultra triple-junction gallium arsenide solar cells. 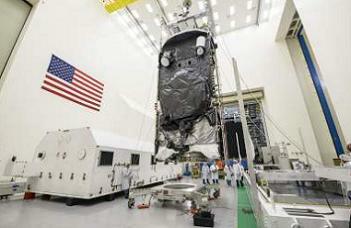 “By working together with Intelsat and building on the 702MP’s flexible, modular design, we have tailored each satellite to offer the specific capabilities required while delivering them on or ahead of schedule,” said Craig Cooning, chief executive officer of Boeing Satellite Systems International and vice president and general manager of Boeing Space & Intelligence Systems. Boeing introduced the 702MP line of satellites in 2009 in response to customers’ need for spacecraft with 6 to 12 kilowatts of power. As part of Intelsat’s fleet replacement and expansion plans, Intelsat 27 was to replace Intelsat 805 and Galaxy 11. The satellite would have completed Intelsat’s global broadband mobility platform, which was to consist of 10 beams on seven satellites. Intelsat 27 was also augmented with a UHF hosted payload for use in government applications. In addition, the satellite was to provide direct-to-home and video distribution services. The launch of the Intelsat 27 was delayed by one day due to a conflict with NASA resources associated with the use of the Telemetry and Data Relay Satellite Systems (TDRSS) network used by Sea Launch for in flight telemetry tracking, related to the successful launch of United Launch Alliance’s Atlas V with the TDRS-K satellite. 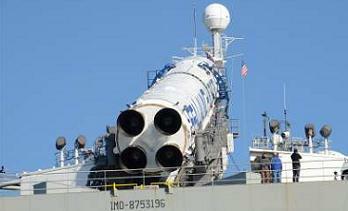 This launch campaign was the fifth ocean-based mission for the new Sea Launch Company, formed since the old company went out of business over two years ago. However, it is not clear as to what impact this failure will have on the company. 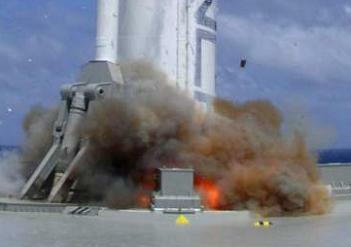 After all, the old company’s demise came just a year after they returned to flight in January, 2007 – following the major impact of the failed launch which occurred with the NSS-8 communications satellite for SES New Skies, after the vehicle exploded on the launch pad, destroying both the vehicle and satellite. (Over 300mb of exclusive multi-angle video and hi res photos – available in L2 – LINK). Since reforming, the new company has successfully launched Atlantic Bird 7, Intelsat 19, Intelsat 21 and Eutelsat 70B from their Odyssey Launch Platform in the Pacific Ocean. More will follow when news is available.